Why Consider Early Orthodontic Treatment? Though an orthodontist can enhance a smile at any age, there is always an optimal time period to begin treatment, dependent on the orthodontic problem that exists. Beginning treatment at the right time ensures the best result in the least amount of time and with the least expense. The American Association of Orthodontists recommends that the initial orthodontic evaluation should occur around age 7, at about the time of eruption of the upper permanent front teeth. At this early age, orthodontic treatment is usually not necessary, but vigilant examination can anticipate the most advantageous time to begin treatment. Drs. Berkman and Shapiro provide comprehensive initial examinations–to children as well as adults–at no charge. When should most patients begin treatment? 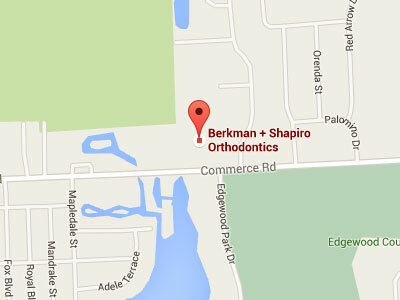 Dr. Berkman & Dr. Shapiro firmly believe that the same treatment should be done once, not twice. For that reason, we recommend that most patients don’t begin comprehensive orthodontic treatment until they have nearly all of their permanent teeth. Then why is it so important to have an early orthodontic evaluation? Early evaluation provides both timely detection of problems and greater opportunity for more effective treatment. In cases where it is indicated, early intervention guides growth and development, preventing serious problems, more invasive treatment, and greater expense later. Although orthodontic intervention is not typically necessary before adolescence, an orthodontist can carefully monitor growth and development so that customized treatment may be started at exactly the right time for each individual patient. By the age of 7, the first adult molars erupt, establishing the bite in the back of the mouth. During this time, an orthodontist can evaluate front-to-back and side-to-side tooth relationships, and predict changes. For example, the presence of erupting incisors (front teeth) can indicate possible overbite, open bite, crowding, or gummy smiles. Timely screening increases the chances for a sensational smile later in life. What are the advantages of Early Treatment? Early treatment is also known as interceptive treatment or Phase I treatment. Some of the most direct results of interceptive treatment are: creating room for crowded, erupting teeth, creating facial symmetry through influencing jaw growth, reducing the risk of trauma to protruding front teeth, preserving space for teeth that are coming in, reducing the need for tooth removal, and reducing comprehensive treatment time with braces. Comprehensive treatment typically occurs when all of the permanent teeth erupt and usually involves a full set of braces. No. Only certain bites would benefit from early intervention. In most instances, it is best to wait until all the baby teeth are nearly gone before starting orthodontics. Dr. Berkman and Dr. Shapiro diagnose and consider the problems of each patient individually, in order to determine the optimal time to begin treatment. How long will Phase I treatment take? Typically, Phase I treatment takes between 6 and 10 months, depending on the age of the patient, the type of problem being addressed, and the patient’s motivation/cooperation. Drs. Berkman and Shapiro approach Phase I treatment with a “get in…get out” strategy so that the benefit is maximized while the duration is minimized.